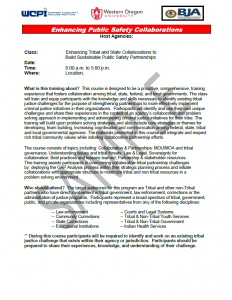 This course, Enhancing Tribal and State Collaborations to Build and Sustain Tribal Partnerships will provide tailored, specific guidance in developing mutual aid agreements, protocols for inter-jurisdictional relationships, protocols for conducting community corrections-related activities, full faith, credit agreements, and any other associated activities. This course is comprised of five modules. 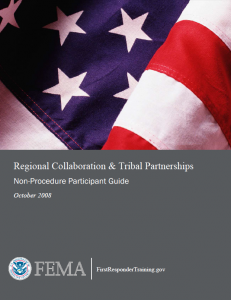 During modules, participants examine and discuss the need for state, federal, and local governments in building collaborative partnerships, understanding and developing mutual aid agreements, protocols for inter-jurisdictional relationships, and the start-up procedures and policies. 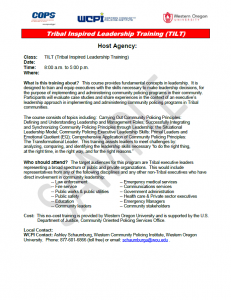 This course provides fundamental concepts in leadership. 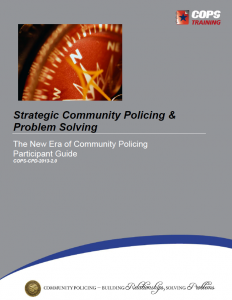 It is designed to train and equip executives with the skills necessary to make leadership decisions, for the purpose of implementing and administering community policing programs in their community. 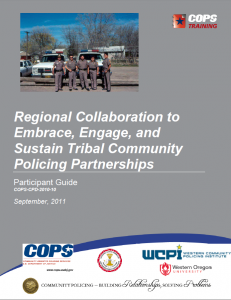 Participants will evaluate case studies and share experiences in the context of an executive’s leadership approach in implementing and administering community policing programs in Tribal communities. This course designed to create, expand, and sustain community policing initiatives across the country. 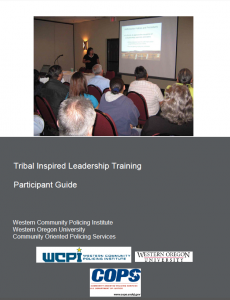 This course, presented by Western Community Policing Institute (WCPI) , is designed to provide initial awareness-level training. Participants in this training serve as representatives for their community/region, by providing useful feedback regarding the issues, problems, resources, and existing initiatives within their region. 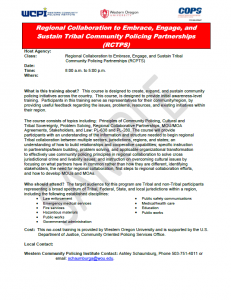 The course consists of topics including: Principles of Community Policing, Cultural and Tribal Sovereignty, Problem Solving, Regional Collaborative Partnerships, MOU/MOA Agreements, Stakeholders, and Law: PL-638 and PL-280. 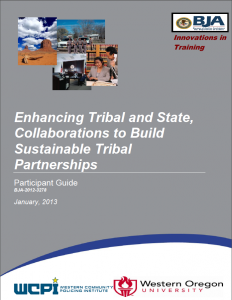 The course will provide participants with an understanding of the information and structure needed to begin regional Tribal collaboration between multiple sectors, jurisdictions, regions, and states; an understanding of how to build relationships and cooperative capabilities; specific instruction in partnerships/team building, problem solving, and applicable organizational transformation to effectively use community policing principles in regional collaboration to solve cross jurisdictional crime and livability issues; and instruction on overcoming cultural issues by focusing on what partners have in common rather than how they are different, identifying stakeholders, the need for regional collaboration, first steps to regional collaboration efforts, and how to develop MOUs and MOAs. 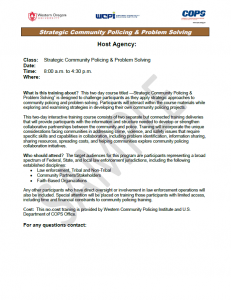 The overarching goal of this training is to advance the practice of community policing as an effective strategy in a communities’ efforts to improve public safety. 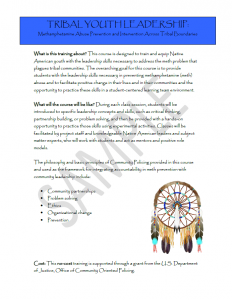 TYL is designed to train and equip American Indian youth (middle and high school level) with the leadership skills necessary to address the public safety problems that plague tribal communities. 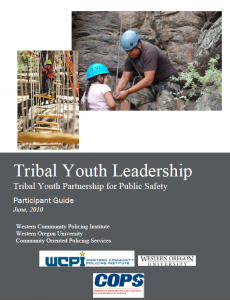 This training encourages and facilitates the development of the leadership skills of tribal youth by encouraging partnerships and enhancing trust with law enforcement. TYL will also provide students with the leadership skills necessary in facilitating positive change in their lives and in their communities. Students will be given the opportunity to practice these skills in a safe student-centered learning team environment. During each session, students will be introduced to specific leadership concepts and skills, such as partnership building and problem solving, and then be provided with hands-on opportunities to practice those skills using experimental activities. Through working in learning teams, students will analyze and apply their skills to complete training assignments and activities. Class sessions will be facilitated by project staff and knowledgeable American Indian leaders and subject matter experts, who will work with students and act as mentors and positive role models. Woven throughout the program will be public safety awareness and prevention information in which students will play an active role in providing the valuable youth-perspective for addressing the public safety problem at the community level. Only with strong partnerships, enhanced networking capabilities, and organized community infrastructures can United States’ communities become vigilant, prepared, and resilient in the war on terrorism and other events of national significance. 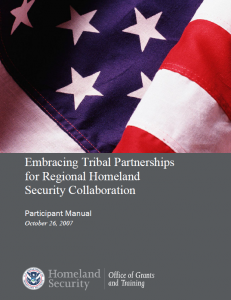 Whether security threats involve acts of terrorism or natural or man-made disasters, a community’s ability to become vigilant, prepared, and resilient depends upon the efforts/partnerships of law enforcement, governmental and non-governmental organizations, community members, and tribal members who are adequately trained and equipped. With the continued threat of terrorist attacks and other events of national significance, now more than ever, it is incumbent on every U.S. citizen to not become a burden in times of crisis. This two-day course is designed to provide law enforcement personnel, governmental and non-governmental organization representatives, and community members awareness-level information, as well as capacity building, that leads to creating vigilant, prepared, and resilient communities for homeland security and events of national significance. This course includes classroom instruction, problem-based learning strategies, and practical “hands-on” activities. Topics include: Problem-Based Learning technique and application, elements of group dynamics (including team building, leadership principles, and conflict resolution), community policing history and tenets, components of homeland security preparedness and response (including terrorism and fear considerations), community responsibility, ethics, vision development, and action planning. This two-day training is designed to bring together Tribal Government, community members and law enforcement top learn techniques on how to empower their communities to ethically identify and solve community problems through the use of community policing concepts, advocacy, and problem-solving. Topics include: Community policing principles, team building, community-police relationships, creating collaborative partnerships, problem-solving through identification, analysis, and response development, facilitating change, and action planning. During this training, relationships are formed and teams return to their respective tribes/communities to implement their action plans applying problem-solving and collaborative partnership strategies. 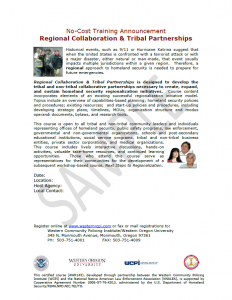 In support of the Department of Homeland Security Preparedness Directorate’s Office of Grants and Training (G&T) mission to assist state, local, Tribal, and territorial governments to prevent, protect against, and respond to incidents of national significance and catastrophic events, and to complement existing WCPI homeland security efforts, this course offers a unique, innovative, and non-duplicative national training approach to enhancing national homeland security preparedness for emergencies and disasters of all kinds on Tribal lands and in Tribal communities. 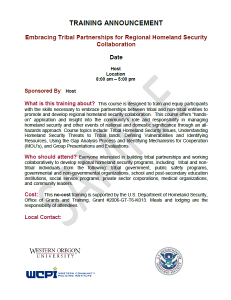 This course addresses the unique, significant, and often overlooked threats to homeland security on Tribal lands and surrounding jurisdictions, with a focus on building working, effective, and efficient collaborative partnerships through Tribal lands. Course content includes specific instruction on coordinating homeland security preparedness assistance expenditures and planning efforts on a regional basis, maximizing manpower, assets and resource inventories to produce effective collaborative efforts, resource tools and methodologies that promote a national approach for critical infrastructure protection, and improving responses in planning and community outreach. Course materials will also include instruction on how to identify and prepare vulnerable populations before an event.